During their Formal Meeting on April 6, 2017, the Johnson County Board of Supervisors proclaimed April 9-15, 2017 as Public Safety Telecommunicator Week. The video for this meeting can be seen here. Supervisor Janelle Rettig read aloud the proclamation recognizing the dispatchers for their work. A copy of the proclamation can be read here. The staff of the Johnson County Joint Emergency Communications Center (JECC) was presented with the Team Telecomunicator of the Year Award for 2015 at the Iowa APCO Spring Conference in Des Moines on April 12, 2016. The JECC was one of three finalists for the award. The team was nominated by the management staff of the JECC for the teamwork that was displayed during the tragic shooting that occurred at the Coral Ridge Mall on June 12, 2015. “The teamwork went beyond those that were working that evening as well. We had staff come into work without being called in because they knew the center would be overwhelmed with phone calls and radio traffic. Our overflow E-911 system was also put to use and calls were being answered by the staff at the Cedar Rapids Joint Communications Center in addition to the JECC. This was truly a team effort by everyone and a great example of inter-agency cooperation”, said Tom Jones, Executive Director for the JECC. In total over there were over fifty-three (53), 9-1-1 calls that were answered in a 12 minute period from the start of the incident. Of those 53 calls, forty-one (41) were in the first three (3) minutes. During those first 3 minutes, twenty-one (21) calls were answered by Jonson County and twenty (20) calls were answered by Cedar Rapids. 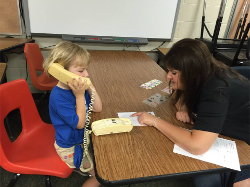 Over the next ninety (90) minutes, the JECC received and processed a total of 215 phone calls. In addition to the phone calls in the first 3 minutes, three dispatchers handled a total of forty-six (46) radio transmissions from responding officers. 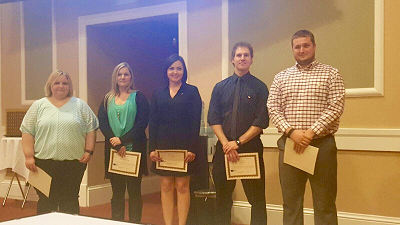 Pictured from Left to Right: Lori Snider, Tiffany Regenwether, Kelsey Marquez, Rick Gisolf and Logan Hanrahan. 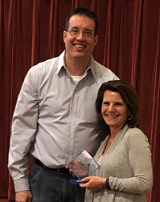 Annie McCreedy was given the 25 year award at the APCO Awards Banquet In Des Moines, IA on Tuesday, April 12, 2016. Annie has been a public safety dispatcher with the Johnson County Sheriff's Office and is currently at the Joint Emergency Communications Center. Congratulations to Annie and her many years of service! Annie is pictured with APCO President Joe McCarville. Staff members from JECC participated in this year's Safety Village in Iowa City. Safety Village is a two-week safety camp where children learn about saftey in a hands on way. Kids enrolled at Safety Village learn pedestrian and car safety, and get experience with staying safe around water, on bicycles, near railroads, at the playground, on a farm, and even in their own backyards. They ride pedal cars each day on the miniature streets, guided by real police officers and fire fighters, to learn safety rules. Children even get some hands-on experience with fire emergencies, when they learn how to safely exit a small model home containing artificial smoke. 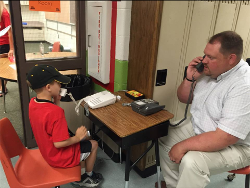 JECC staff worked with children on the importance of the 911 system and how to call 911 in the event of an emergency. Children then practiced calling 911 in a mock exercise.